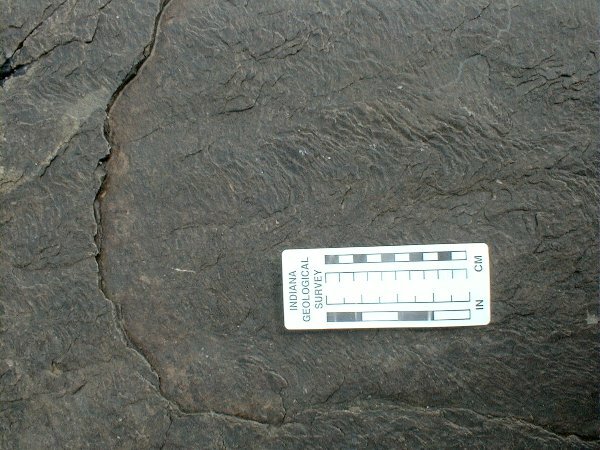 The structure seen on this surface is rib-and-furrow, a plan view of ripple trough cross-lamination. It is a smaller scale version of trough cross-bedding. The structure is formed by the downstream migration of sinuous-crested, lunate or linguoid ripples. When seen in plan view like this, palaeocurrent directions may easily be measured - note that the cross-laminations dip to the left. Move your cursor over the image to see some of the troughs, aligned parallel to the current. On this surface, all of the current directions have a subparallel alignment. This is the top of a sharp-based sandstone, which may represent a crevasse splay from a delta distributary channel.